Pictured: The Dean’s Series of paintings of leaders of the John A. Burns School of Medicine. Deborah Manog Dimaya photo. 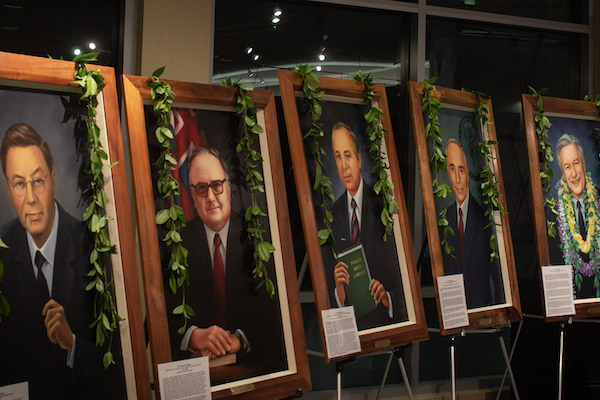 Paintings of the John A. Burns School of Medicine (JABSOM) Deans are unveiled at the Dean’s Circle event on March 6, 2019 in the Waiola Cafeteria on the Kakaako campus at the University of Hawaii Manoa. Dr. Benjamin Young, former Dean of Students and a passionate student of medical history in Hawaii, described each dean as medical students lifted the painter’s cloths off of the portraits, each mounted on easels for the occasion. The paintings are rendered in oil and framed in koa wood. Each is two feet by three feet. Linus Chao, the artist, attended the ceremony, as he did the initial unveiling of the first painting of the series, that of Dr. Windsor Cutting, JABSOM’s first dean, at a 2017 JABSOM Alumni Continuing Medical Education event and gathering. Chao painted a large bust of former Hawaii governor John A. Burns in 1970, a painting which now hangs in the Dean’s Office at the medical school named after the Governor Burns. The paintings of Dean Cutting, Dean Rogers, Dean Gulbrandsen, Dean Cadman and Dean Hedges are hanging in the Dean’s Office in the Medical Education Building on the Kakaako campus. The paintings are supported by a generous donation to the medical school for that purpose. Funding for the Dean’s Portrait Project is provided by the Bushnell-Judd Fund at UH Foundation. Contributions to the fund may be made to the Bushnell-Judd (Account #12450902) or by contacting JABSOM Development and Alumni Affairs Director Julie Inouye at (808) 692-0873.